We all love to keep our home clean and when it comes to disinfecting the house you must get the right product. The main function of disinfectants is to keep the house free from bacteria, fungus and mould. Though there are several varieties and brands available in the market you must be using the correct cleanser which will make your house fresh and clean.In fact, if you have kids playing around on the floor cleaning the house is utmost essential.Housecleaning may be a daunting task but if you use the right sanitizers maximum of the task gets solved. Myrtle disinfectants is prepared with only the best and most essential ingredients from the plant. Using it makes your home germ-free, clean and smelling beautiful. Therefore, you and your family can be free from allergies and rashes. Lemon myrtle disinfectant is prepared from a native Australian tree growing naturally from Brisbane to Rockhampton. This plant only enhances the aesthetic view but also has various antiseptic properties. The plant base is used for products like medicines, disinfectants, sprays, soaps, moisturizes and more. Therefore, householders those who use this cleaner can easily get rid of germs. Children are more prone to diseases as they pick up food from the floor and swallow anything lying there. Disinfectant cleaners kill the germs that can cause many illnesses like food poisoning and more. This food-safe cleaner is easy to use and leaves the floor 99.999% bacteria free. Having this cleanser in your home means you can easily clean your kitchen, bathrooms, toys, dishes, and silverware. It is food safe therefore, you can wash your cutting boards and knives with it too. Lemon Myrtle has an amazing smell which leaves the room fresh and smells free. The lemon and lime flavour stays for hours after use. All you need to do is mix it with water before use. Moreover, it is earth safe and user-friendly. Therefore, users do not run any kind of harm. Unlike acids, and other chemical disinfectants, this cleanser is absolutely natural. Hence, you must use it according to the dilution instruction as using raw Disinfectant can challenge the good bacteria. Using it in your garden can keep the flowers and plants fresh. In fact, spreading it around the patio can stop the growth of mould. 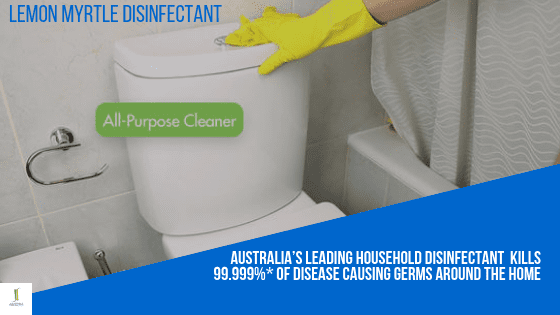 In case you want to clean away all the grime, mould and other disease-causing bacteria, research has proved this disinfectant to be effective. Contact Juverna International now to shop our personal care products!